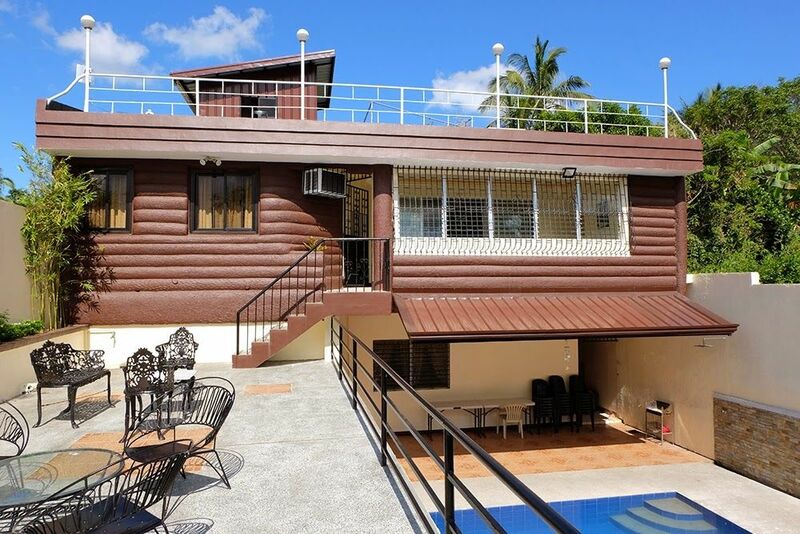 This 2-storey, 4-bedroom vacation house in Tagaytay City, Philippines, with a private infinity pool. It is perfect for family gatherings, class reunions, wedding preparations, team buildings and small parties. Rental rate includes use of private swimming pool, videoke, satellite TV, LPG, barbecue grill, and WiFi. Feel free to send your inquiries only here at HomeAway website or hit that "Book Now" button to secure the house. HomeAway accepts Credit card, Debit ATM card or PayPal. Lot Area = 240 sq. m.
Floor Area = 250 sq. m.
This 2-storey house is fully furnished with Filipino design hardwood furniture in the living and dining rooms. It has 4 bedrooms (3 on the second floor, one on the ground floor), 5 bathrooms (2 en-suite), fully equipped kitchen and a two-car gated garage with concrete deck roof. The first floor consists of the following rooms/areas: (1) Dining Room; (2) Formal Kitchen; (3) Dirty Kitchen with Toilet and Bath; (4) Laundry Room; (5) a Common Toilet and Bath, and; (6) a Bedroom with a bunk (double deck) bed and single floor mattress and en-suite Toilet and Bath. The second floor consists of: (1) Living Room; (2) Covered terrace with toilet; (3) Master's Bedroom with queen size bed, queen size sofa bed and en-suite Toilet and Bath; (4) Bedroom with queen size bed and single floor mattress; (5) Bedroom with 2 bunk (double deck) beds and one single floor mattress, and; (5) Common Toilet and Bath. On the front yard of this property is a 5x7 meters infinity pool which is 3 to 5 feet deep. In-pool lighting that changes color every few seconds adds drama and elegance to this vanishing-edge pool, perfect for night swimming. The living room has a 40 inch flat screen satellite TV and a videoke/karaoke machine. The kitchen is equipped with a refrigerator, microwave oven, rice cooker, electric kettle and 2-burner gas stove. Cooking is allowed in the kitchen. Cookware, tableware, cooking and eating utensils are provided. Grilling is allowed in the patio. Griller is provided and the charcoal may be bought at 50 pesos per kilo. A hot and cold water dispenser may be rented. Only one hundred pesos for 5 gallons of mineral water (inclusive of water dispenser rental). All of the 3 bedrooms in the second floor (including the master's bedroom) are air-conditioned. Rooms/areas without air-con have electric fans. There are 2 queen size beds, 1 queen size sofa bed, 3 bunk (double deck) beds, 2 queen size floor mattress and 4 single floor mattress. We provide complete bedding for up to 20 persons. All of the 4 showers inside the house have water heaters. Bed linen and pillows are provided. Bath towels may be rented for 100 pesos each. Guests are welcomed by our caretakers, Junel and Mark , upon arrival. They are available to assist the guests during their stay. Hi! I am Minerva and I welcome you to my home. I love going up to Tagaytay especially after a really busy week. I like to spend my weekend in a quiet place and breathe fresh air while enjoying the company of friends and family. You can also do this (and more) at Casa Minerva. We had the Worst Vacation Experience ever, we will never go back to this Place again, No WIFI connections, Smelly Rooms and Kitchen, Pools are not Cleaned and Videoke are not provided, not a secure place tp stay. Place was nice. Owner and caretakers were very accommodating to our requests. One thing we noticed was unlike other places, they do not have the starter kit/set that houses usually have (bread, water, etc.). Overall, our family had fun in our 3 days and 2 nights stay. We had a great time in tagaytay and the place was really great. We mostly was outside when we was awake. The caretaker was helpfull when we had questions and we didnt not notice him and his family much. The kids loved the swimmingpool and had many hours spent there. I will be sure to try and use the house next time we visit tagaytay. My family of 20 stayed at Casa Minerva last December 28-29. It was a superb experience. The host is always patient to answer questions and the caretakers are very nice. 1. From Tagaytay-Nasugbu Highway, turn to Maglabe Drive. 2. Take the first right. 3. Turn right again at Cruzado Extension. 4. The third house on your left with black and brown gate is Casa Minerva. You may also follow the road signs leading to HJM Retreat House and LilyBoy's. You may call our caretaker/s Junel or Mark at +63967-6521570 or +63933-8268402 to guide you. If using public transportation, one may take a tricycle from the intersection of Maglabe Drive and Aguinaldo Highway to get to Casa Minerva.